Somos+, Joanna Coumbié — The Cuban economic model, one that is imprecise, vague, and very particular to Cuba, does not manage to meet the needs of the Cuban people. The nominal wage does not come close to the actual salary that a Cuban citizen needs to cover their basic necesities and, in this respect as in many others, the Guidelines set forth in the previous Congress of the Communist Party of Cuba have failed to be implemented effectively; according to official figures, only 21% of the proposals have actually been carried out. In Cuban president Raúl Castro’s own words, this whole process should be carried out “without haste but without pause,” however we should ask ourselves whether this phrase can ever be realistic for the Cuban people. Having to wait over 57 years for the promises made by Fidel Castro in his speech known as “History Will Absolve Me” to be put into effect puts this current wait into question. It is not the first time that a similar process has been implemented in Cuba. Appearing to recognise the mistakes that have been made, necessary rectifications of mistakes and negative trends have been set out on more than one occasion, in each case with the apparent objective of distracting the population, making sure that their attention is diverted away from the serious economic and social situation that has plagued the country at various points in history. 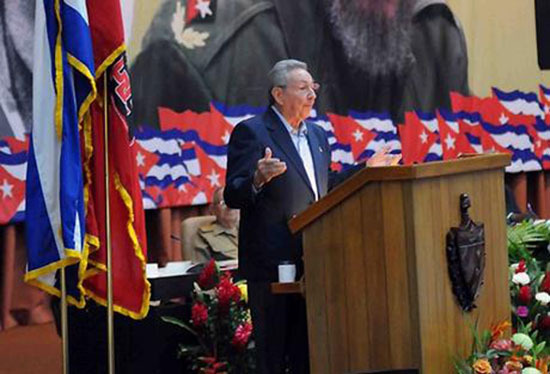 And now Raúl is back at the 7th Congress of the Communist Party of Cuba (known as the PCC) with the same discourse. Nothing has changed and in his speech he repeats this same fateful phrase that has led to many a frustrated hope for the people of Cuba and many a useless plan. Part of the population hoped that this 7th Congress would bring change, change that has to happen sooner or later, but we did not think that it would come via a party that has lost its reason for being in this society, if it ever had one. Remaining in the same political confinement to which we are accustomed will not be a sufficient reason for the oposition movements in Cuba to walk step by step towards necessary change, even though the communists finish their congress in the same way it started: without haste and with many pauses.